This isn’t new, but I think really relevant in the context of all this Behavioural Economics-inspired talk of perspectives, biases, and mental short-cuts. Have a look at the diagram below. 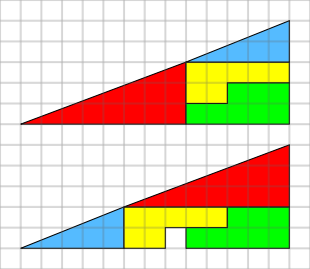 It shows two triangles, each comprised of the same shapes, only re-ordered. To prove that they’re the same, the triangles are helpfully set against a background grid. And yet, somehow, there’s a single square on the grid that’s missing in the second iteration. What on earth is going on? How do you account for the missing square? The more you look at it, the more impossible it seems. Without a rational explanation, what do you do? How do you explain it away? The thing is, these two triangles are not the same at all. They’re not even triangles. The long edge of the the shape actually bends somewhere in the middle – it’s not one line but two. There’s a full, and revealing, explanation here, that details how an apparently very small difference can accumulate into a pretty significant visible distinguishing feature, depending on how you frame it. And how our inability to see small differences can lead to misleading conclusions.